At the risk of blowing my own trumpet, I would claim these to be among the best brownies you can eat. I would be be so proud to serve these to anyone….if I don’t eat them first! 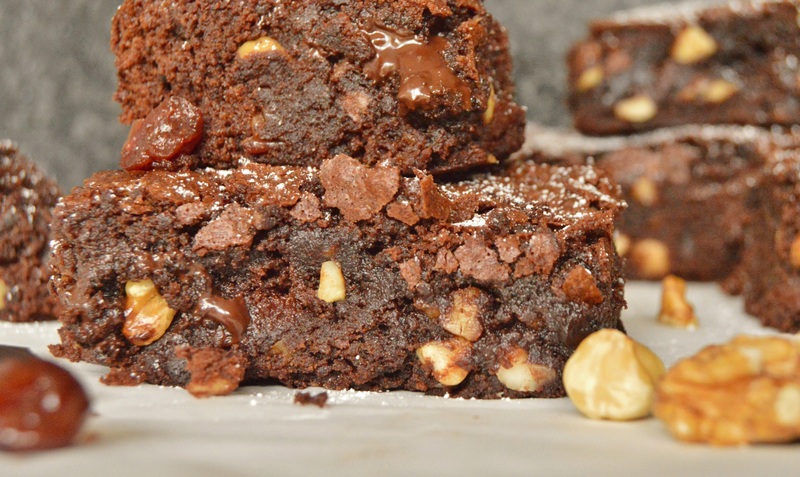 Brownies are very quick and simple to make, with a mixture that is so versatile that you can add all manner of goodies to the basic brownie mix eg) replace the nuts with dried fruit or crushed biscuits…….. I use a recipe that I have had for decades, although I do tweak it from time to time, sometimes making it gluten-free but sometimes not. This particular incarnation uses an ingredient that is fairly new to me: smoked chocolate. However, I must stress that if you cannot get hold of this they still taste wonderful with normal dark chocolate. I tasted smoked chocolate at a food market recently and loved it, so I needed no persuasion to buy a large bag of it! 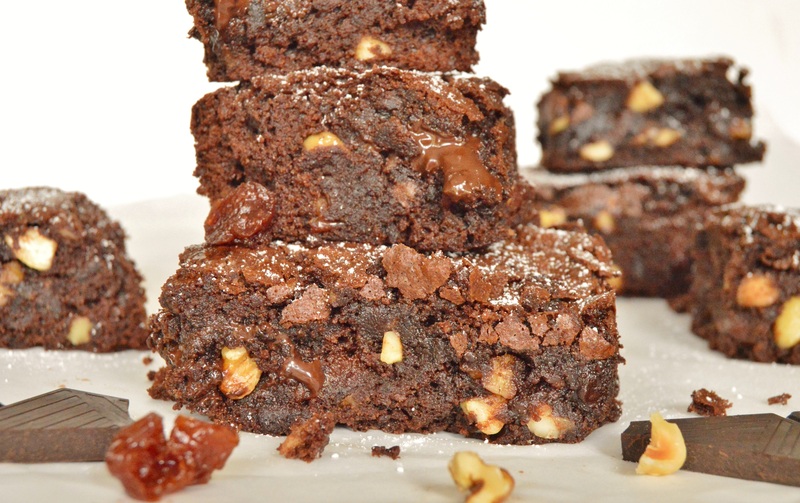 As I mentioned above, these brownies can of course be made with normal dark chocolate for a wickedly indulgent treat. But if you can get hold of smoked chocolate then go for it! I have also made a successful vegan version of these, replacing the butter with a mixture of vegetable oil and walnut oil, and even on a few occasions using all olive oil. I also use vegan chocolate and omit the eggs. In place of the eggs I add 50ml water and an extra teaspoon of baking powder, which gave enough of a rise and a very nice level of gooeyness. (1) Preheat the oven to 160C(fan). (2) Melt the butter and the smoked chocolate together in a small bowl, either over a pan of barely simmering water or in short bursts in the microwave (10-15 seconds at a time, wait a little, then repeat: once the butter has heated up and melted, you can stir the chocolate and it will melt quickly). (3) Sift the flour, cocoa powder and baking powder together in a medium bowl. Stir in the sugar and salt. (4) Pour in the melted chocolate mixture, the eggs and the “added goodies”, and stir to incorporate fully. Stir in the dark chocolate chunks. 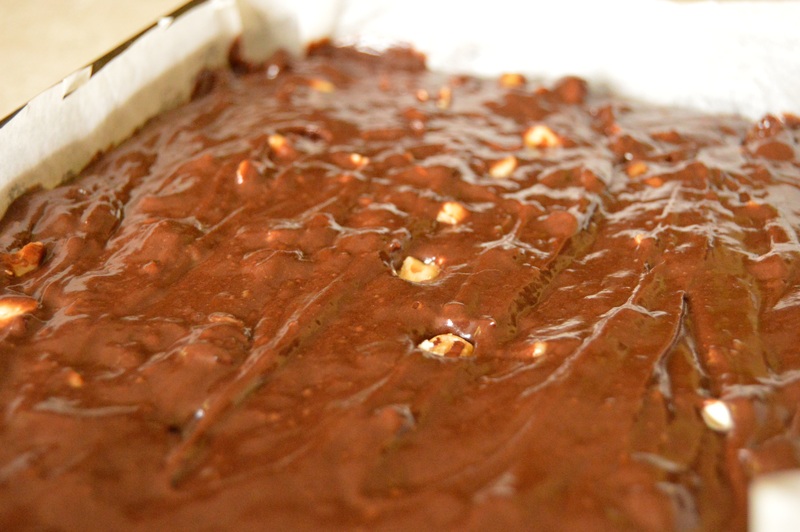 (5) Pour into a rectangular tin, lined with greaseproof (I used a 30cm by 20cm tin). Bake for 20-22 minutes: it will have a nice crust but should feel soft underneath. If it wobbles, it is not cooked enough; in which case bake for a few more minutes – just until there is no wobble. NB: if you use a larger tin, giving a thinner depth of mixture, reduce the baking time by about 5 minutes. (6) Leave to cool fully in the tin before slicing. oh it is a fab ingredient. I bought some a few weeks back at a food market stall (never seen it before!) but it is so easy to smoke it in a BBQ with wood chippings and the like.